Lately, bullet proof coffee has been increasingly popular with regard to weight loss. The original recipe is credited to David Asprey from the Bullet Proof Diet. Which combines coffee, butter and Brian Octane Oil and is placed in a blender until frothy like a cappuccino. Consequently, healthy fats are associated with weight loss and mental clarity. While I love butter, I also wanted to take my bullet proof experience to another level with beneficial healthy fats in my weight loss journey. So I replaced the butter and Octane Oil with Coconut Oil and heavy whipping cream! Coconut Oil holds many beauty and health benefits. Coconut oil is an antibacterial, anti-fungal and anti-viral natural remedy. The oil is packed with antioxidants, Lauricc Acid, Capric Acid and Caprylic Acid. So, what does this mean to you? It means it’s a healthy fat and is easy to digest, resulting in fat being immediately turned into energy rather than your body storing it. Additionally I’ve found that many people don’t like the bitter taste of coffee. I have seen many people douse their coffee with loads of sugar, processed creams and flavoring. Which makes this coffee an excellent choice if you are following a low carb diet. This is because it taste so good and rich! Place all of your ingredients in a blender and pulse for a second or two. Pour into your coffee cup and viola! Of course you can just add the coconut oil and whipping cream to your coffee, which I often do on lazy days! Either way, it’s delicious. Bottoms up! Are you ready to take the bullet proof challenge? Kick start your weight loss with coconut oil and the Egg Fast Diet! Can you also add butter to this? Have you tried adding essential oils to flavor your coffee and get added benefits from them? I’m taking a class on essential oils and was just wondering if you’ve tried it and if so which ones you like to add. Sounds really good with pancakes, I will have to try that! Coconut oil is really a magical oil with so many health benefits. In Indian cuisine , in many regions it is incorporated in the daily food and is also the medium for cooking. I definitely have to check out whether coconut oil and that many eggs are safe for diabetics–just in case! I love Coconut oil but didn’t even know the properties and benefits. Thanks for sharing. Omg this coffee sounds great!!! I’m a huge coconut oil fan so i must give this a try! I had no idea of the benefits of coconut oil! I might have seen / used it in hair products. But nothing else. I’ll check out where I can find some coconut oil! It has so many benefits. I have never used coconut oil. it know there are many benefits to it. Perhaps I should try it. I have never used coconut oil in the past. This is something that I have been hearing from more and more people though that it can be very beneficial and great to use. This is the first time that I’m hearing about this. 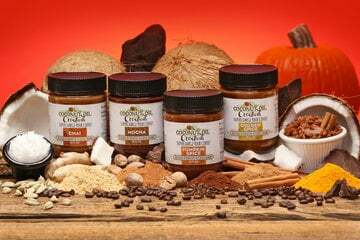 While I’m not a fan of coconut oil, the benefits that you mentioned convinced me to read more about coconut oil bullet proof coffee. How many pounds have you lost? Wow this is really interesting! I love having coffee, and slimming down a bit is fine with me. Does this can helo to get away bloated tummy? I’d definitely need something that increases my energy lever,thus I’ve been cranky, tired and restless. Coconut oil I use for many other things in my everyday life, so might take you up on this tip! Thank you, I hope you enjoy it! So healthy for you. Normally I would not even think about trying this but I recently had egg coffee in Vietnam and it was delicious. I use coconut oil in every other aspect of my health, why not coffee. 🙂 I hope you like it. I love coconut oil and all it has to offer. Coconut Oil is one of the famous organic thing here in the Philippines and there’s a lot of things you can benefit using coconut oil. I’m a coffee lover and I haven’t tried adding coconut oil in it. Frankly speaking it my 1st time to hear about coffee and butter. Is this ok with people with Fatty Liver? I am not sure about the fatty liver part, I would ask a physician, I do know that coconut oil is a healthy cleansing fat and does not clog up arteries but as with anything if you have any health concerns always a good idea to consult a doctor. This SOUNDS amazing! My husband does this with the original butter recipe. But coconut oil is brilliant! Thank you, I hope He gives it a try and like it. I think so much healthier than butter and taste good too! Mmm, we love coffee in our house, so it’s great that you can add it to coffee. I never knew coconut oil had so many benefits. Coconut oil is great for lots of other things too – both external and internal applications are helpful to the body. In addition to consuming it in my coffee from time to time, I also use it as a moisturizer for my skin, a sort-of leave-in conditioner for my hair, makeup remover – everything! I even use it for oil pulling! I do the oil pulling too, It really has so many amazing healing properties! Thanks for your comment. My native place is Kerala famously called as God’s own country. It’s at the southern tip of India. Why I talked about my place is because we have the largest coconut tree in the country and it’s our state’s official tree. Yet! Many benefits you shared was unknown to me. Very knowledgeable. Thank you for sharing! Thanks Jerin, I’d love to visit Kerala. I hope you can add more coconut oil into your daily regimen. I read somewhere that the oil is used in India for oil dropping on forehead, not sure how works but for relaxing and balancing, will have to see if I can find that info, was very interesting. Wow. I’ve been using coconut oil but I had no idea it could do these things!!! AMAZING! I love the coconut since I was child, In fact I grow in a country that doesn’t product the coconut at all due to the climate, so we could get only the coconut powder and it was too dry, since I moved to the Us I am taking advantage , buying all sort of coconuts , oil, powder whatever, so thank you for your post love it . Thanks for reminding me about Coconut Coffee. I had it once long back and loved its taste. Somehow I never tried it again and forgot all about it, till I read your blog post. Gonna try it out now. I am very amazed by this! I knew coconut oil was beneficial for so many things but never thought about adding it to coffee or that it could help with weight loss. Just read your other post and congratulations on the -70lbs!